M Hotel Makkah by Millennium, a 5-star hotel located in the heart of the holy city of Makkah, is your ultimate place to create unforgettable memories with your family. With excellent facilities combined with superior hospitality, both adult and young guests are guaranteed the sweetest escape in the city. The hotel recently unveiled its Family Suite package giving families plenty of reasons to enjoy the winter season. With rates starting from 333 Saudi Riyal, guests will stay in one of the hotel’s luxurious and spacious suites featuring the best amenities, complimentary high-speed Wi-Fi internet connection, 25% discount on food and beverages and 25% discount on laundry. The package comes with breakfast and facility for an early check in and late checkout, subject to room availability. Book two consecutive nights and stay for free on the third night. As you begin your beautiful journey together, M Hotel Makkah will plan every detail of your special wedding day to create a magical celebration that personifies your romance. Whether you prefer an intimate gathering or a grand gala, turn your fairy tale dream wedding into a reality with our unrivalled offer starting 111 SR per person. While in Makkah, guests can discover the city’s popular attractions including the Great Mosque of Makkah (Masjid Al haram), the Black Stone, Mount Thawr, Mount Noor (light), Hudaybiyah, Arafah, Musdalifah, Mina, Mosque of Aisha, Mount Arafah, Zamzam Well, Haramain Musueum, Kswah factory, Prophet Mohammad Museum and Bya’ah Mosque. After a long day of spiritual excitement, families staying at M Hotel Makkah can get together for lunch or dinner at the hotel’s three dining outlets including Tasneem restaurant, the all day dining restaurant offering a variety of Arabic, Middle Eastern and International Cuisine; Al Multaqa Lounge is suitable for large groups with special buffet menus, and M Café located in the hotel’s lobby offering freshly prepared pastries, cold and hot drinks and ice cream. 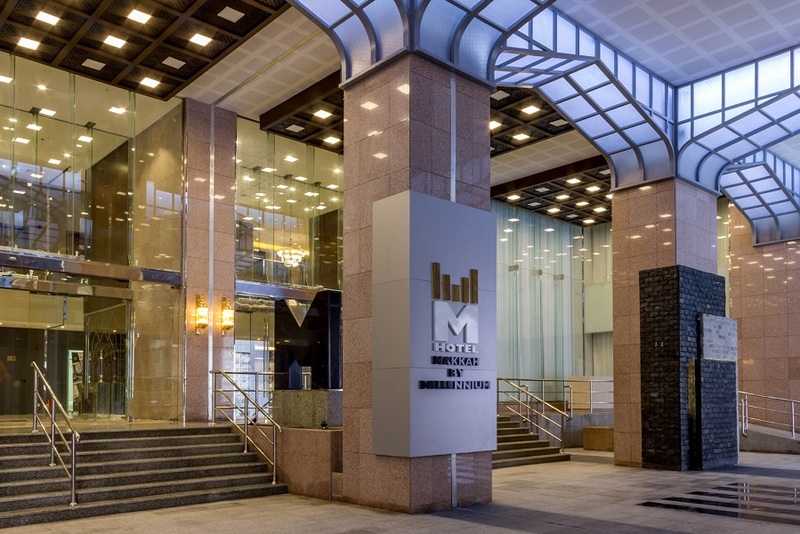 M Hotel Makkah features 785 rooms and suites, individually controlled air condition, electronic door locks, in-room electronic safe box, iron & ironing board, LED HD TV, major satellite channels, mini fridge, praying mats, intl’ direct dialing, hair dryer, magnifying glasses in bathrooms.